Evreux, Musée. 18 November 2007 through 17 Februar 2008. 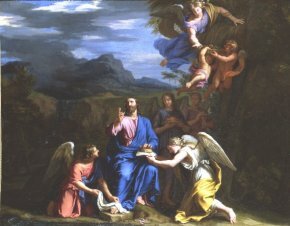 Despite the monographic study on him by Bernard Dorival some years ago , Jean-Baptiste de Champaigne remains relatively unknown due to the fact that he is strongly overshadowed by his uncle. 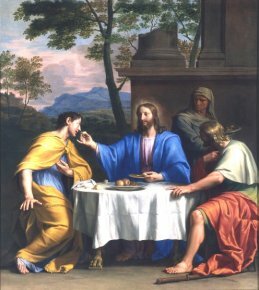 Although several paintings have been published, when works are considered too weak to be by Philippe de Champaigne the tendency today is still to ascribe them to his nephew. And when a painting does not seem good enough for Jean-Baptiste, then it is immediately attributed to Nicolas de Plattemontagne. As demonstrated by Dominique Brême and Frédérique Lanoë, the organizers of the exhibition, this practice only leads to total confusion. Therefore, it was high time to re-evaluate from scratch. And they achieve so superbly since the museum goer leaves Evreux with the feeling of having understood, at last, Jean-Baptiste’s manner which, while still creating his own style, owes as much to his uncle as to Lebrun, and also of discovering, there is no other word for it, Nicolas de Plattemontagne. By choosing to display only definitive works — except for one or two pieces — including a great number of newly ascribed ones that are perfectly convincing, the organizers provide the correct method for studying the many artists that gravitate around the masters. The same should be done for some of Vouet’s and Le Brun’s disciples. The exhibition opens with a few works by Philippe de Champaigne. This is the first chance to view the charming preliminary study for the ceiling at the Palais Cardinal (ill. 2 ; cat. 1) since its acquisition by the Louvre at the Ciechanowiecki sale . Puzzlingly, the only debatable works are located in the same section as the Portrait of Three Children from the Musée des Arts décoratifs in Lyon (cat. 3), whose attribution to Philippe is strangely enough, still questioned (it was recently displayed in Chambéry under Caspar Netscher’s name...) and the two versions of a portrait by Philippe ascribed to Jean-Baptiste. After viewing the only known drawing by Jean Morin (cat. 7), a collaborator of Philippe de Champaigne and the uncle of Nicolas de Plattemontagne, along with a few prints, the visitor to the exhibition enters into the heart of the matter with the presentation of about twenty canvases definitely acknowledged as being by Jean-Baptiste. Although it is true that he was a remarkable copier of his uncle’s works, the artist’s own creations prove that he knew how to detach himself from the master. Dominique Brême defines his style in a few characteristic elements that apply without any doubt to the paintings displayed here : “les anatomies puissantes, les expressions volontaires, les attaches épaisses, le canon trapu et la facture assez sommaire des personnages situés au second plan, sans parler du caractère esthétisant de la gamme chromatique recherchant des harmonies chaudes” . The hang side by side of paintings such as The Pilgrims of Emmaus (ill. 3 ;cat. 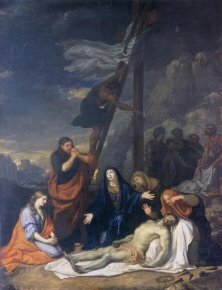 24), The Crucifying (Magny-les-Hameaux, Musée du Port-Royal ; cat. 25), The Transfer of the Relics of Saint Arnould (Great Britain, private collection ; cat. 26) and a magnificent canvas which, alas, is not in the catalogue, The Beheading of a Saint (France, private collection), allows for enlightening comparisons. This last work, shown with a cautious “ascribed to”, is without any doubt as Dominique Brême firmly claims, a masterpiece by Jean-Baptiste de Champaigne, which, to paraphrase Pierre Rosenberg, is worth more than a dubious work by Philippe de Champaigne. Bending slightly his own rules, Brême also displays a painting held in Switzerland (ill. 4 ; cat. 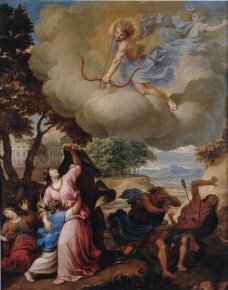 19) from a private collection, which came up for auction in 1993 and again in 1999 with an attribution to Nicolas Coypel and for which the name of Jean-Baptiste de Champaigne had already been hypothesized at the time. Coypel’s authorship is understandable but the work’s new identity fits perfectly well. The figure of Ceres can thus be linked to the beautiful and melancholic Reclining Woman Holding a Bow in Brussels, the Allegory of Peace in Budapest and Aurora Chasing the Night acquired a few years ago by the Louvre . The last three are part of the décor at the Tuileries where the artist painted several rooms. Jean-Baptiste de Champaigne’s work as a decorator was in fact quite extensive. The only remaining examples in situ are the ceiling for the Hall of Mercury in Versailles, and for which can one view here a modello of the central compartment (Versailles, Musée National du Château ; cat. 18) and the “cul-de-four” for the Chapel of the Holy Sacrament at the Val de Grâce in Paris. Among the many discoveries in the exhibition, there is also the Two Putti (France, private collection ; cat. 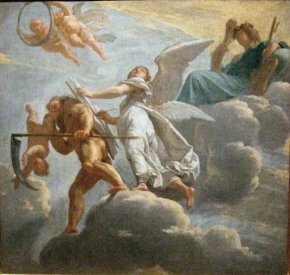 16) from the ceiling of the dauphin’s chamber at the Tuileries, two superb drawings of angels already published by Nicolas Sainte Fare Garnot in 2000 and 2003 but never shown (Pairs, BnF ; cat. 22 and 23) and two magnificient paintings, Christ in the Desert Served by Angels (ill. 5 ; cat. 27) and a Crucifixion (cat. 31) from private collections. The Punishment of Niobe’s Children, c. 1680 ? Nicolas de Plattemontagne is a true revelation. In fact, his style has little to do with Philippe de Champaigne. The manner in which his work is being reassembled since the pioneering article published by Pierre Rosenberg and Nathalie Volle in 1980 lends itself to a fascinating analysis. The painting from Orléans, The Punishment of Niobe’s Children (ill. 6 ; cat. 41) was placed among Le Brun’s followers, the most recurrent name being that of François Verdier. By regrouping a number of drawings with the mention Montagne, Rosenberg and Volle were able to ascribe this canvas very probably to Nicolas de Plattemontagne. Frédérique Lanoë has also brought together an ensemble of works with an attribution which leaves no room for doubt when seen here at the exhibition in Evreux. Thus, a drawing from the Albertina is a preliminary study for one of the rare preserved and documented paintings by the artist, an Adoration of the Shepherds from the Church in Avallon in the Yonne region of France. This pen and wash drawing (cat. 50), compared to a work on paper (cat. 40) with the same technique and directly related to the painting from Orléans, reveals the same hand. An attribution for this work is thus confirmed indirectly. This method of confronting works enables art historians, by transitivity, to reconstitute a corpus which has now reached seventeen paintings and about eighty drawings. It is interesting to see who these paintings were ascribed to previously, besides Verdier, quoted a bit too often, with an easily recognizable graphic style but whose painted oeuvre deserves to be studied in the same manner as Plattemontagne’s. 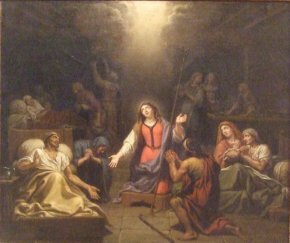 There are also Noël Coypel — like for Jean-Baptiste de Champaigne — to whom a study or other version of the Adoration of the Shepherds in Avallon sold at Christie’s in 1992 was attributed, Nicolas Colombel with his name still on a painting at the Musée Girodet (Moses Saved from the Waters ; cat. 39) not long ago and even Le Brun to whom a very beautiful Lamentation over the Dead Christ (ill. 7 ; cat. 45) is withdrawn although it was exhibited in Versailles in 1963 at the retrospective devoted to the King’s First Painter. Although Plattemontagne’s style recalls that of all of these painters, it remains nevertheless a personal one and its most characteristic trait is the manner in which he associates, along with a kind of classicism, a dark palette which can, at times, as pointed out by Dominique Brême, call to mind a Rembrandtesque effect (ill. 8). There is no doubt that this exhibition will allow many paintings which are still anonymous or under another name to be restored to the artist. A short section is devoted to the cycle of the Life of Saint Benedict for the apartment of Anne of Austria in the Val-de-Grâce. This series has also presented many problems as it is clear that it is a collective work of several different artists. A work on paper which was recently acquired by the Louvre is confirmed as being by Jean-Baptiste. There are also drawings by Plattemontagne and a third unidentified artist and the characteristics of some figures which appear to be by Philippe de Champaigne himself, such as the one at the center of The Resuscitated Child, thus providing valuable information about the collaborations in his workshop. The catalogue is as remarkable as the exhibition itself. The texts are well written, thorough and well-documented, offering unpublished pieces and new attributions. The reproductions are excellent ; all of the paintings, drawings or prints on display are accompanied by complete entries. There is also an index ; the footnotes appear on the same page and not at the end of the chapter or volume ; the illustrations have full legends and can be found next to the explanatory text. We only wish all books and catalogues had the same reader’s interest in mind. This cultural event signals the awakening of the Musée d’Evreux which had never organized an exhibition on old art. Its director, Laurence Le Cieux, who arrived three years ago, was previously head of the Musée Bossuet in Meaux where she had already enacted a remarkable exhibitions policy. 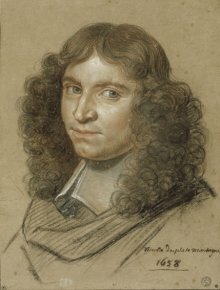 She has launched a project for the study of the collections (where art lovers of the XVIIth century can admire notably a large Saint Margaret by Dufresnoy and where Dominique Brême has just identified, while preparing the exhibition, a drawn Portrait of Nicolas Poussin (ill. 9) which he ascribes to Juste d’Egmont) and has also adopted a policy of acquisitions (see News of 28 December 2007). Less than an hour’s drive from Paris, this fascinating retrospective is definitely worth the trip. Visitors information : Evreux, Musée, Ancien Evéché, 6, rue Charles Corbeau, 27000 Evreux. Phone : +33 (0)2 32 31 81 90. Opened daily from Wednesday through Monday, 10.00 to 12.00 and 14.00 to 18.00. Admission : 4 € and 2 €. Bernard Dorival, Jean-Baptiste de Champaigne (1631-1681). La vie, l’homme et l’art, Paris, 1992. Etude Beaussant Lefèvre, Importante collection d’esquisses françaises du XVIIe au XIXe siècle, Paris-Drouot, Friday 28 June 2002, rooms 5 and 6. "the powerful anatomy, the determined expressions, the thick joints, the heavyset types and the rapid execution of the figures in the background, as well as the aesthetic character of the chromatic scale expressing a warm harmony”. 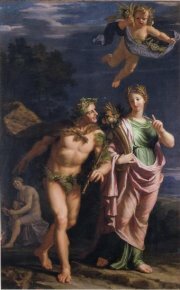 The Allegory of Peace and Aurora Chasing the Night are not in the show but are reproduced in the catalogue.